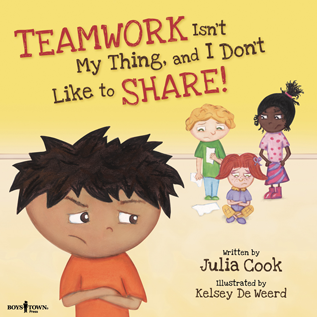 Teamwork Isn’t My Thing and I Don’t Like to Share! RJ’s having another bad day. His teacher wants him to work with bossy Bernice, messy Frankie, and Norma (who just sits and picks her nose) on a report about Egyptian mummies. After a frustrating school day with his “team,” RJ goes home to find only one cookie left in the jar. And his mom makes him share it with his sister! With the help of his coach, RJ learns that working as a team and sharing are skills needed not just on the soccer field, but in school and at home too! This book in the Best Me I Can Be! series from Boys Town Press teaches children in grades K-6 social skills that can make home life happier and school more successful.